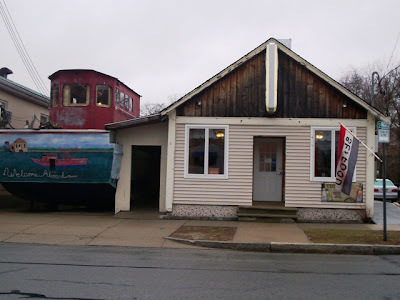 Because we happened to be going to New Bedford to do our recyclables (don't ask), we decided to interrupt our Bristol tri-city reviews and have a late lunch at The Boat. We'd resume our Bristol reviews (click here for Redlefsen's), within the next few weeks. So it was at 3:30 p.m. that we found ourselves facing a boat - yes, a real boat - right on Ashley Boulevard. We walked up the plank (lol, walkway) into what I thought was the restaurant. However, we were instructed to take a left into the actual boat. I was thrilled. 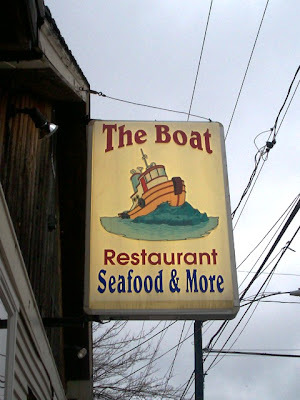 I thought the boat was just a gimmick to show that this was a seafood restaurant. I didn't really expect to be eating in it, but we were, and I was like a kid in a ... boat! 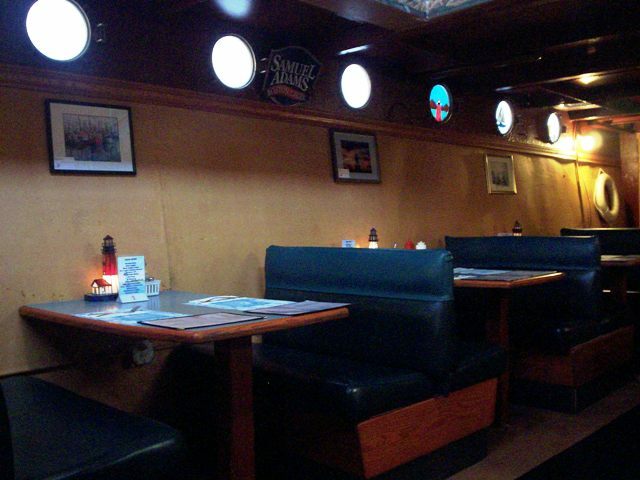 There was additional seating in the non-boat part of the restaurant. We seated ourselves at a very worn booth (the seats of most of the booths were taped) and looked around. This place was all nautical themed and kitchy. There were anchors and wheels and fish galore. 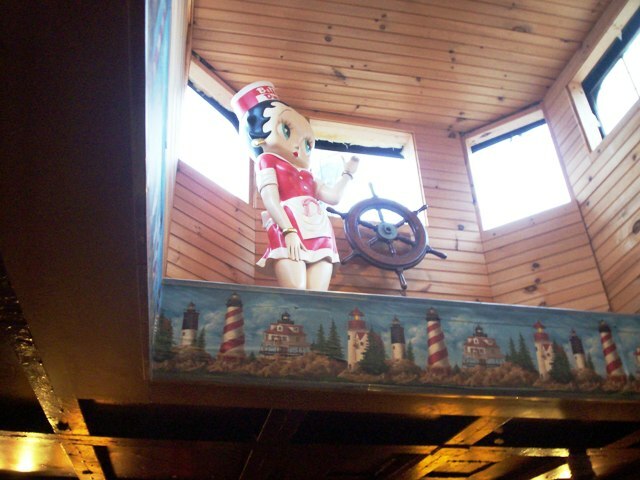 There was a huge Betty Boop on the upper "deck". The restaurant was cute and busy, although a little well-worn. There was so much stuff to look at, my head was on a swivel. A cute young lady brought us our menus and took our drink order - two Diet Cokes. We perused the menu and everything looked good. This is like your favorite clam shack, but inside. For appetizers they have stuffies, clam cakes, onion rings and more. They also have chowders and salads, club sandwiches, hot dogs and burgers. They have seafood rolls (tuna, shrimp, scallop, clam, oyster and lobster). They also have seafood that is baked, done Mozambique style, fried up in plates or pints, and even clam boils. Homestyle dinners are even on their menu, like salmon and meat pies and chicken and buffalo tenders, all served with two side dishes. For dessert you can try some chocolate, bread or Grapenut pudding, pie or ice cream. That's a big menu for such a small place. They'll even make up party platters (with notice). 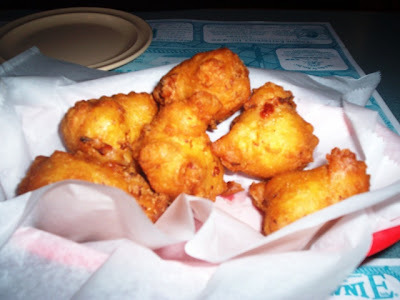 When our gal returned with our drinks, we ordered six clam cakes to start our repast. Then Laura went with the baked stuffed fish and I ordered the regular-sized fish and chips. Laura ordered fries and cole slaw as her two sides and mine came with both. It didn't take long for our clam cakes to arrive. Maybe that was the problem. A couple of them were a little too underdone. They were quite doughy instead of being light and fluffy as I prefer. They didn't taste horrible, just heavy and with a raw dough aftertaste. Laura's baked stuffed fish wasn't stuffed! There was a crumb-like mixture on top of the fillet but in no manner was it stuffed. The fillet itself - which the waitress told us was cod - didn't taste bad. Cod and haddock (which we prefer) is usually all white, but this fish had a darker underside. It did not, however, taste "bad" and along with the pretty good fries and vinegary cole slaw made for an ok meal. Perhaps they should have chosen a better grade of cod. 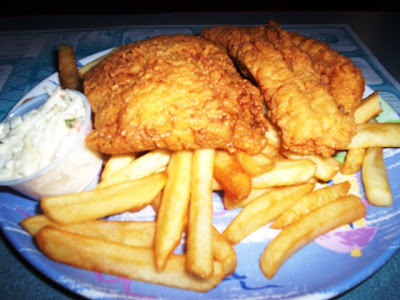 My fish and chips were a nice sized portion of two fried fillets over a mound of fries. A little cup of slaw was included. I had the same problem Laura did - that dark undersection of fish was just unappetizing. I ended up bringing half my meal home. Hubby wanted to try it and heated it up for himself. He too wasn't impressed. It's too bad because I love fish and chips and order it often. Maybe the fish should have been of a higher quality? I'm not sure. The fries were ok, the cole slaw ok but again, a little vinegary. THE VERDICT: I don't think we'll be coming here again. I know this place has its fans but I have to be honest, we've had much better seafood at other places. I don't even mind that the place is kind of run down; actually that's part of its charm. 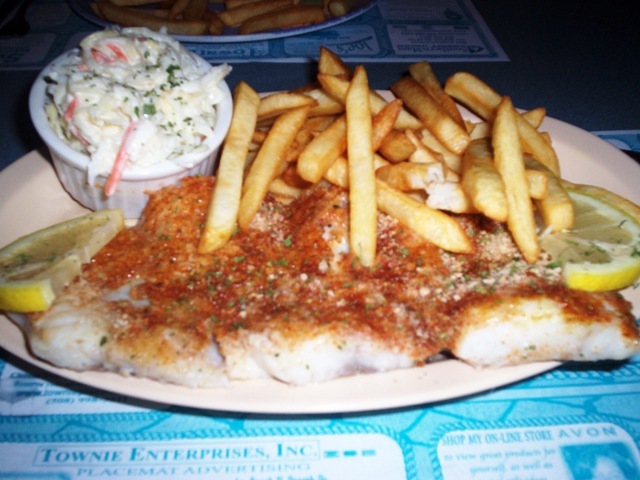 But the food should be a lot better especially in New Bedford, which has several fine seafood restaurants. We checked out the restroom, as we always do, and it was very neat and clean and all nautical. Very cute. With 20% tip, we left $33 including a $10 gift certificate from MenuJoy.com (so we really only paid $23 - yeah!). 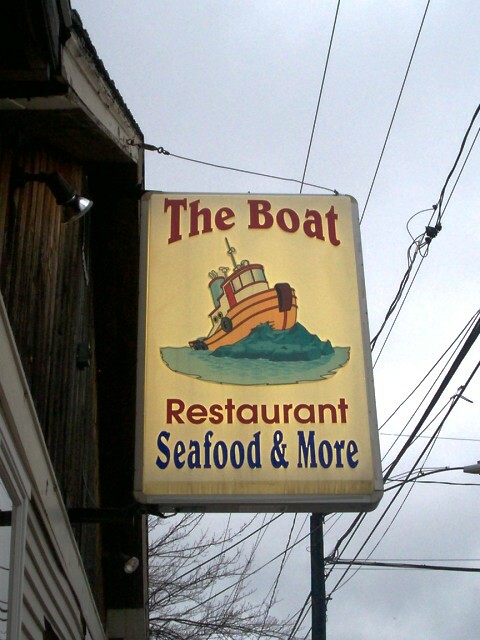 The Boat doesn't have a website, but you can check out their full menu by clicking here. The Boat is open from 11 a.m. to 7 p.m. Wednesday, 11 a.m. to 7:30 p.m. Thursday, 11 a.m. to 8:30 p.m. Friday, and 11:30 a.m. to 7:30 p.m. Saturday. The restaurant is closed Sunday, Monday and Tuesday. P.S. - To our cute waitress, who was very nice and polite, please don't sing constantly in the dining room. Some people like that ... but some don't. Don't forget to check out MenuJoy.com for great area restaurant menus.